Three days and counting until the Ministry of Sound World Tour 2011 hits Durban shores. 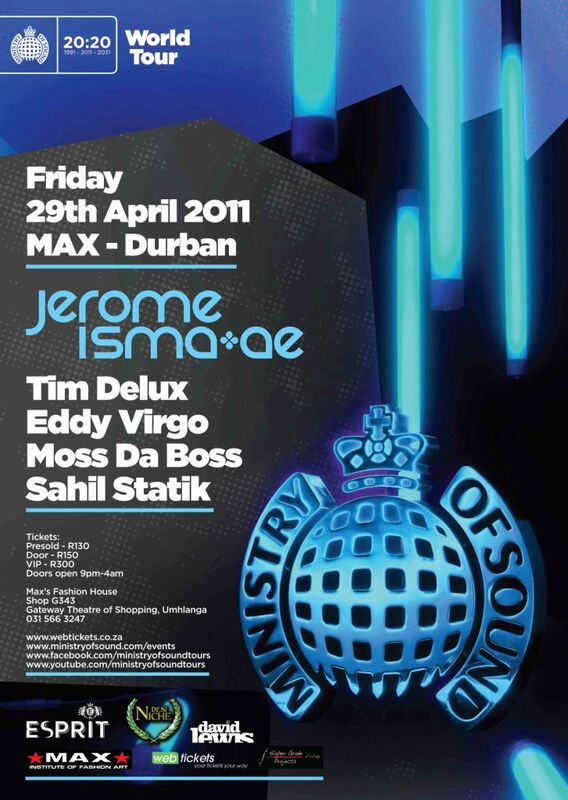 Join us as we celebrate one of the world’s leading clubbing brands, Ministry of Sound as it returns to South Africa with a bang this April for ‘Ministry of Sound World Tour 2011’. Featuring Jerome Isma+ae one of the hottest international DJs as well as the likes of Tim Delux, Eddy Virgo, Moss Da Boss, Sahil Statik and many more. The Socialite will be there for another Video Showcase so why not join us at what is sure to be one of the hottest VIP events of the year when we see some of the world’s finest take to the decks in a one night only exclusive. The Durban event will take place on the 29 April 2011 at the Max Institute of Fashion Art in Gateway and tickets are selling out fast. Pre-sold tickets are available at R130 and tickets will be available at the door for R150 or R300 VIP. You can purchase your tickets online at www.webtickets.co.za or contact Bux on 073 3186 604 and Adrian on 072 433 7860.